Schooling in the region known as Micronesia is today a normalized, ubiquitous, and largely unexamined habit. As a result, many of its effects have also gone unnoticed and unchallenged. By interrogating the processes of normalization and governmentality that circulate and operate through schooling in the region through the deployment of Foucaultian conceptions of power, knowledge, and subjectivity, this work destabilizes conventional notions of schooling's neutrality, self-evident benefit, and its role as the key to contemporary notions of so-called political, economic, and social development. This work aims to disquiet the idea that school today is both rooted in some distant past and a force for decolonization and the postcolonial moment. Instead, through a genealogy of schooling, the author argues that school as it is currently practiced in the region is the product of the present, emerging from the mid-1960s shift in US policy in the islands, the very moment when the US was trying to simultaneously prepare the islands for putative self-determination while producing ever-increasing colonial relations through the practice of schooling. The work goes on to conduct a genealogy of the various subjectivities produced through this present schooling practice, notably the student, the teacher, and the child/parent/family. It concludes by offering a counter-discourse to the normalized narrative of schooling, and suggests that what is displaced and foreclosed on by that narrative in fact holds a possible key to meaningful decolonization and self-determination. Disassembling and Decolonizing School in the Pacific:A Genealogy from Micronesia is one of the most impressive, intellectually sophisticated works of scholarship on Micronesia that I have ever read. It is a truly insightful study that examines critically the idea of schooling in Micronesia, and finds it to be anything but a force for decolonization. Much of the extant scholarship on the region views formal, Western-style education as an inevitable, desirable and necessary component of the modernist project. Kupferman's discursive approach brings a new, challenging, and much needed interdisciplinary perspective to an old, tired, taken-for-granted topic. This work will also be of interest to scholars and educators dealing with colonial and other externally imposed systems of education. 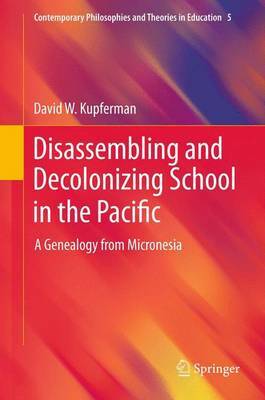 A powerful and original achievement, David Kupferman astutely puts to work contemporary theory in the study of state-sponsored schooling in Micronesia. Covering an impressive array of materials across the fields of education, cultural studies, and Pacific Islands studies, Kupferman demonstrates the strength of theoretical intelligence to retrieve the politics neutralized by institutionalized knowledge systems of schooling. This is a brave book by a courageous scholar.